As a newcomer to Fanny & Alexander, I was surprised to learn that the original format of the project was a four-part TV miniseries spanning over five hours. That series was subsequently edited down to a still-massive three-hour movie for worldwide theatrical presentation, which is the version most recognized by U.S. audiences. Criterion's new Blu-ray box set contains both versions of the project, with one disc for each version, along with a third disc containing supplemental material highlighted by a feature-length documentary filmed concurrent with the feature production. Famed director Ingmar Bergman intended this project to be his final feature, and it was also one of his most personal projects. The film follows a young boy named Alexander (Bertil Guve) and to a much lesser extent his younger sister Fanny (Pernilla Allwin) as they navigate family dynamics in their well-off clan in early 1900s Sweden. Their parents are happily married and both involved in theater, which was apparently quite profitable at the time considering their opulent lifestyle in a massive palatial estate attended by a full staff of servants. When the father suddenly dies from a stroke, the mother begins a relationship with the stern local bishop and eventually agrees to marry him, moving her family from their lush and free-wheeling lifestyle to a drab, nearly monochromatic home where the children learn to fear the bishop's strict rule. Eventually, the extended family steps in to rescue the children from the bishop, but they are unsuccessful in all attempts to force him to divorce his now-pregnant wife, leading her to take matters into her own hands, a desperate act that strangely mirrors Alexander's own dreams. With the bishop finally out of the picture, the family returns to a happier way of life surrounded by their friends and relations. The principal difference between the TV and theatrical versions of the project is the nearly total elimination of Alexander's fantasies from the shorter cut. That obviously makes the theatrical film a much more realistic and tighter story, and yet Bergman reportedly greatly preferred the full cut with its flights of fancy untouched. I found enough brief fantasy moments remaining in the shorter cut to adequately convey the boy's active imagination, and in fact found that the cut still seemed entirely too long, making even its shorter viewing an endurance test. In both cuts, there's too much needless periphery remaining, such as a worthless subplot involving Alexander's ribald old uncle and his silly affair with a family housekeeper that results in a surprise addition to the clan. It was also puzzling to me why Fanny got top billing when the film was quite clearly told from Alexander's perspective, leaving her as little more than a tag-a-long character. 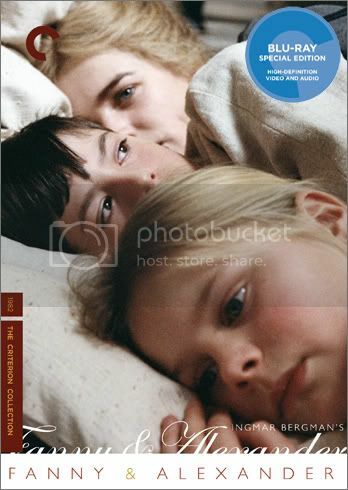 While I wasn't a fan of the film, the package as a whole won me over thanks to the inclusion of the revealing feature length documentary The Making of "Fanny and Alexander" directed by Bergman from footage shot during the feature film's production. Here the curtain is pulled back on the entire creative process, offering viewers an unprecedented look at the work in progress and Bergman's efforts to realize his vision. It's a celebration of the art of filmmaking, a fascinating time capsule of the film's early '80s production era, and a fine coda to the feature career of this highly esteemed director. The Blu-ray image quality is grainy due to the original film stock, but with such rich colors and hi-def details revealed in the ornate family estate that the move to the bishop's dull home is viscerally shocking. Sound quality is unremarkable but beefed up to an uncompressed version of the original monaural soundtrack for Blu-ray. The remaining bonus features include a 40-minute series of retrospective interviews with cast and crew members, as well as an hour-long interview with Bergman filmed for Swedish TV in 1984.